Zootopia depends entirely on its well-intentioned allegory about prejudice. Not that there's anything inherently wrong with that. Plenty of contemporary animated features have lacked thematic ambition, offering up some variation on the "Rudolph the Red-Nosed Reindeer Rule" which essentially assures kids that "different-ness" is OK, and you need to be true to yourself, and so on and so forth. Zootopia digs deeper. That's worth something. It is, unfortunately, also the majority of what Zootopia has going for it. The premise sets up a world of talking mammals who have civilized themselves and formed a society where they all interact in a relatively human way. Among them is Judy Hopps (Ginnifer Goodwin), a young rabbit who dreams of becoming a police officer, despite there never having been a rabbit police officer in Zootopia's history. Yet she works hard enough to make it onto the force—only to find that she isn't taken seriously by the water buffalo police chief (Idris Elba), and is immediately assigned meter-maid duty. Goodwin's voice performance does a lovely job of establishing the mix of determination and self-doubt that follows Judy into her work, while the screenplay by Jared Bush (Big Hero 6) and Phil Johnston (Wreck-It Ralph) effectively introduces background elements that impact her personality, like the anxiety of her own parents and a traumatic childhood encounter. 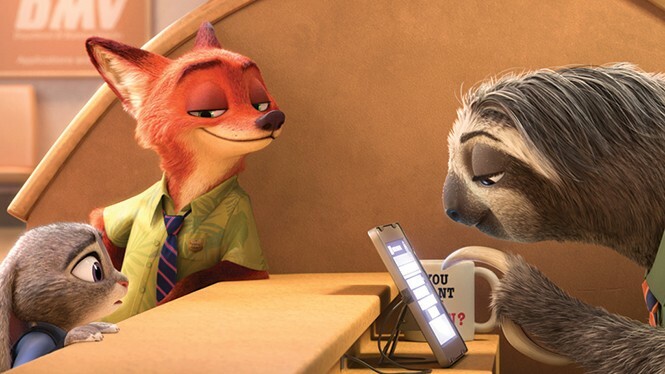 As Judy gets her big break working on a missing persons—um, missing otter—case, she brings along street hustler fox Nick Wilde (Jason Bateman) as a reluctant partner, allowing Zootopia to ride on the familiar rhythms of a "mismatched buddy cop" movie. To Zootopia's credit, those are much more welcome rhythms than those of the "our world, but with different kinds of characters" set-up that characterizes so much feature animation. The film mostly bypasses cheap, obvious animal-pun gags based on familiar product names—although you do get the occasional Lemming Brothers bank, or Targoat—and builds the relationship between Judy and Nick with enough depth that their conflicts feel genuine, and earned. What's missing, however, is depth to its world-building. The concept establishes a central, integrated melting-pot "hub" of the animal-occupied city, surrounded by individual, artificially maintained habitat-based regions like tundra, savanna, rain forest and the like. Yet beyond that idea providing multiple visual environments for the filmmakers to create—and a couple of high-energy chase sequences—there's no real sense for why those habitat "ghettos" are at all relevant to the story, as though that were a concept that felt too risky to explore in mass-market animation. It's even more confusing when it starts to feel that Zootopia is working against its own message to get easy laughs. One extended sequence is set at the animal equivalent of the DMV, which is staffed entirely by slow-moving sloths. It's a decent-enough idea, until you realize that it's based on a stereotype: This kind of animal has one particular kind of character trait, and every one of them is the same. The same notion pops up when Judy takes advantage of the fact that all wolves start howling when they hear one howl. For a movie built entirely around "don't judge an animal by its species," there's also plenty of "a leopard can't change its spots." That's not to say that there isn't also a welcome complexity to the way Zootopia approaches prejudice: as fuel for demagoguery; as something that's not easy to avoid even if you've been a target of it yourself; as a cycle that encourages despair in those who get tired of fighting against assumptions. It's a great starting point for introducing kids to the idea. But its ideas also never sneak up on you emotionally the way, for example, Inside Out managed with its exploration of childhood's end; it's more like that vintage Star Trek episode about the aliens with half-white/half-black faces, allegory writ large and highlighted so there's no confusion. The result is sporadically fun but clunky, well-intentioned but rarely powerful. Prejudice is bad. It's an important idea to convey, with plenty of better ways to convey it.